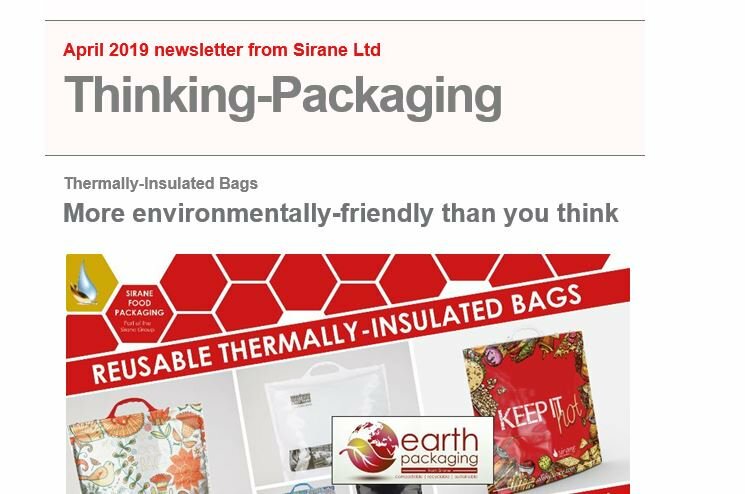 Simon Balderson, Sirane MD, said: “Thermally-insulated reusable bags for part of our Earth Packaging range, which in the current climate, being a plastic bag, some people might find a bit odd… but we’ve added it to the range because we feel it is ‘green’. “It’s made from just one component, polyethylene – the handle, film and insulation are all made from polyethylene - which means it is easy to recycle. In fact, it’s the only bag of its type which has been endorsed by the UK Recycling Association. “Furthermore, it can be re-used again and again. This is a durable bag which is made to last. “It’s even possible to replace some of the virgin polyethylene with a waste sea shell product, so compared to the insulated woven PP products out there, it’s a far more eco-friendly solution. After a long life, the bags can just be put in with the recycling. Both off-the-shelf and custom-printed versions of the bag are available, and there are a range of potential sizes offered, including bags small enough to be lunch-bags. Our Earth Packaging range includes paper-based absorbent pads, plastic-free packaging solutions, compostable bags and films, compostable plant pots and more.